Try to see that... Squares A and B are the SAME Color and Shade. No matter how hard you try... you will see them as different... BUT they are... exactly the SAME Color & Shade. You can do this simple experiment. Download the STILL Image and use an Image Software like Paint Brush (or any other software you are familiar with) to help you See the Truth... OR... See the GIF Animation Image below. 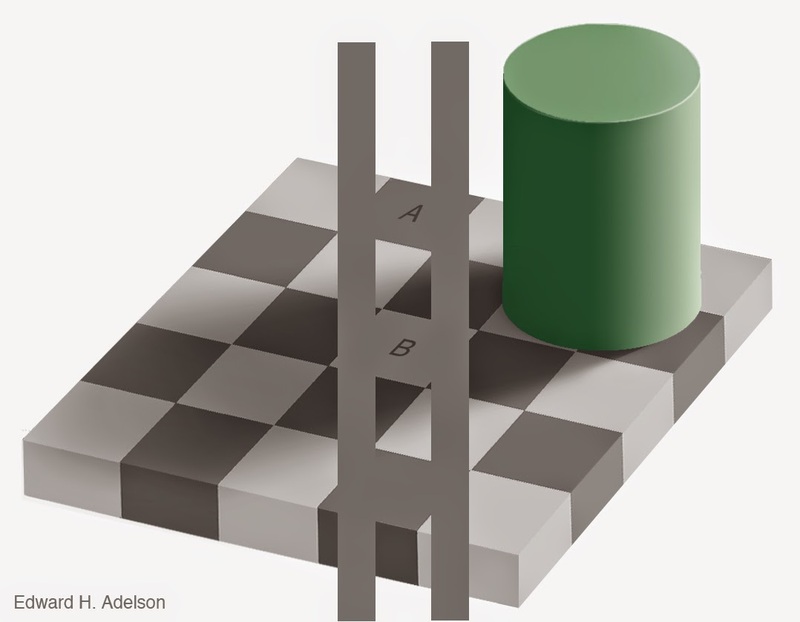 The checker shadow illusion is an optical illusion published by Edward H. Adelson, Professor of Vision Science at MIT in 1995. The image depicts a checkerboard with light and dark squares. The optical illusion is that the area of the image labeled A appears to be a darker color than the area of the image labeled B on the 2D plane of the rendered 3D projection. However, they are actually exactly the same color on the 2D plane of the image file (but not necessarily in the 3D projection) which becomes especially obvious if the projected 3D scenery is rendered partially or entirely defective. Opening the illusion in an image editing program and using the eyedropper tool to verify that the colors are the same. Cut out a cardboard mask. By viewing patches of the squares without the surrounding context, you can remove the effect of the illusion. A piece of cardboard with two circles removed will work as a mask for a computer screen or for a printed piece of paper. Connecting the squares with a rectangle of the same color, as seen below in the middle figure. Print the image and cut out the squares. Cut out each square along the edges. Remove them. Hold them side by side. Isolating the squares. Without the surrounding context, the effect of the illusion is dispelled. This can be done by using the eyedropper tool in image editing programs, such as Gimp to sample the values of A & B, and to color in the newly adjacent rectangles using the paint bucket tool. The visual system needs to determine the color of objects in the world. In this case the problem is to determine the gray shade of the checks on the floor. Just measuring the light coming from a surface (the luminance) is not enough: a cast shadow will dim a surface, so that a white surface in shadow may be reflecting less light than a black surface in full light. The visual system uses several tricks to determine where the shadows are and how to compensate for them, in order to determine the shade of gray "paint" that belongs to the surface. The first trick is based on local contrast. In shadow or not, a check that is lighter than its neighboring checks is probably lighter than average, and vice versa. 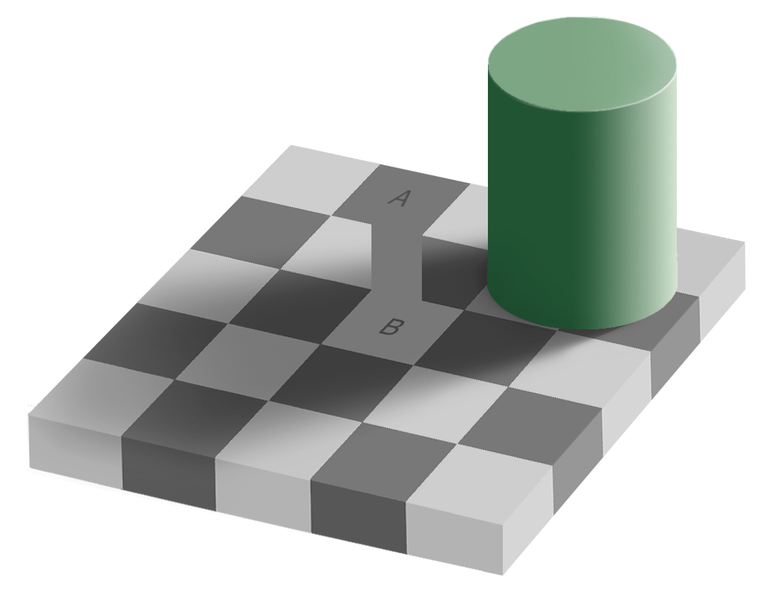 In the figure, the light check in shadow is surrounded by darker checks. Thus, even though the check is physically dark, it is light when compared to its neighbors. The dark checks outside the shadow, conversely, are surrounded by lighter checks, so they look dark by comparison. A second trick is based on the fact that shadows often have soft edges, while paint boundaries (like the checks) often have sharp edges. The visual system tends to ignore gradual changes in light level, so that it can determine the color of the surfaces without being misled by shadows. In this figure, the shadow looks like a shadow, both because it is fuzzy and because the shadow casting object is visible. The "paintness" of the checks is aided by the form of the "X-junctions" formed by 4 abutting checks. This type of junction is usually a signal that all the edges should be interpreted as changes in surface color rather than in terms of shadows or lighting. As with many so-called illusions, this effect really demonstrates the success rather than the failure of the visual system. The visual system is not very good at being a physical light meter, but that is not its purpose. The important task is to break the image information down into meaningful components, and thereby perceive the nature of the objects in view.